In the tenth pAsuram, when parAnguSa nAyaki‘s friends say “would everyone not accuse you?” she says “Am I not searching for them as well?”. Subsequently, parAnguSa nAyaki says “makaranedunguzhaikkAdhan, who is the eliminator of enemies of his followers, residing in thenthiruppEreyil has stolen my heart long ago; I will myself go and search for the towns, countryside and regions where he resides; I have no shyness”. nagaramum nAdum piRavum thErvEn nAN enakkillai en thOzhimIrgAL! Oh friends who are staring to advice me! emperumAn who is having ears which are wearing huge ornament in the form of a fish and who is mercifully seated in thenthiruppEreyil which is present for a long time, having tall mansions with abundance of gemstones, and who has amazing activities just as the beauty with the ornaments, wove his magic and finished dhuryOdhana et al, who are the enemies of his followers, back then; he is having dark cloud like matchless radiance in his form and the divine chakra; he stole my heart long ago; I will go and search for him in the town, the region and other cities; I don’t have shyness. nagaramum nAdum … – Friends ask her “Looking at your determination, the rural people, urban people and all others are accusing you”, she replies “Do I really seek emperumAn? No. I only seek the accusations of the town, region and cities” [It is their accusations which work like manure in providing nutrition to my love towards him – Refer to thiruvAimozhi 5.3.4 “Uravar kavvai eru vittu“]. thErvEn – She is saying that she is searching. As you are not uniting me with him, and as he is not arriving himself, it is these people who throw accusations of speaking about me and him being together and they only sustain me; even thiruvaLLuvar said in thirukkuRaL “alar ezha Aruyir niRkum” (I will survive as the accusations keep coming). piRavum – all other places. nAN enakku illai – I am not having shyness just here; even after reaching there I won’t have shyness. That is, there is no shyness in parAnguSa nAyaki from the beginning. en thOzhi mIrgAL – It is unfortunate that I have to explain this to you! 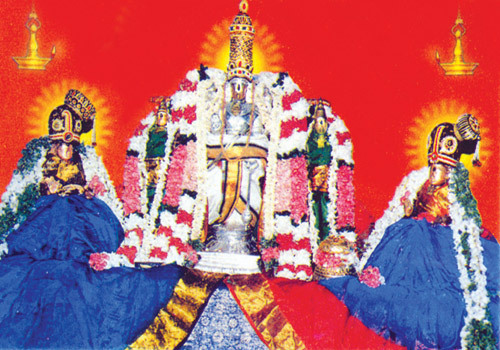 sigaram … – Mercifully seated in the huge thenthiruppEreyil which has tall mansions which are filled with gemstones and which appear as if peaks where brought and placed here. makara nedum kuzhaik kAdhan – One who is having ears which are decorated with makara shaped ornament. If some one becomes immersed in his limbs, can he/she be retrieved? mAyan – She is thinking about the radiance in his form and internal qualities, which have not been explicitly stated here. mAyan – His favouritism towards his followers. nURRuvarai anRu manga nURRa – One who destroys without leaving anyone remaining when he thinks to do so. One who wove his magic to destroy dhuryOdhana et al during the mahAbhAratha war. nigaril mugil vaNNan – His matchless physical beauty which appears like that of a dark cloud. With this – she is implying that his beauty is so hard to ignore that one cannot leave him even if it nurtures the enemies. nEmiyAn – One who is having the instruments to turn day into night, while destroying the enemies. He lifted his chakra and even chased bhIshma et al. nigaril mugil vaNNan – While he remained like lightning and thunder for dhuryOdhana et al, he was like soothing rain for pANdavas to eliminate their suffering. en nenjam kavarndhu enai UzhiyAnE – How long can I survive after losing the instrument [my heart] to do that? How long has it been since he stole my heart showing his beautiful form and his being with weapons? enai UzhiyAnE – It has been many eons. How long has he been planning to steal my heart just as he planned to destroy dhuryOdhana et al? This entry was posted in thiruvAimozhi, thiruvAimozhi 7th centum on August 18, 2018 by Sarathy Thothathri.